Don't ever wait toooo long with cuke's.. Thank you for your suggestion Weezie13. What is the ideal container size for cucumbers? I have a window box (8" X 8" X 24"), will that be suitable for the cucumber transplants? I am planning to transplant them tomorrow. If I had the money, those $6.oo tubs are ideal.. But can't go wrong with the biggest you can find..
Do you have a support system for them to grow up on or anything??? Also I bought a 5 gal bucket from the same 99c store and drilled holes in it and planted an egg-plant. I planted the cukes y'day and the eggplant day b4 y'day. I will update you about their well being . I also planted a bitter gourd in one of the containers and a green bean. Oh, and I bought a pack of 25 bambo stakes from Bog Lots for 99c as well. Right not I have the stakes as th esupport. Later when they grow up a little I will guide them along my balcony railing. 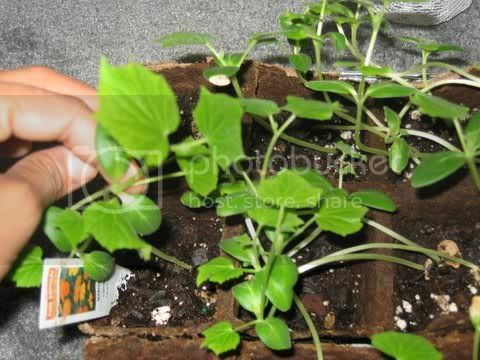 Hi Deepanwita, I was so excited when I got home yesterday b/c my cucumber seeds sprouted!!! 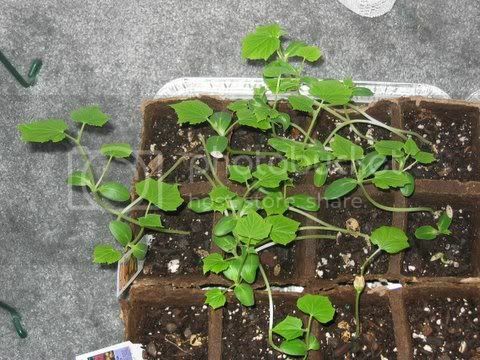 I have them planted in a 13 inch pot, they are the spacesaver variety and the directions said 3 seeds to a 13 in pot. I always did starter plants so this is the first year I have tried the seeds and it worked!!! Because of a lack of space, I have everything in containers;the cuc's, yellow squash,radishes, tomatoes,and banana peppers.Good luck with your cuc's!! !